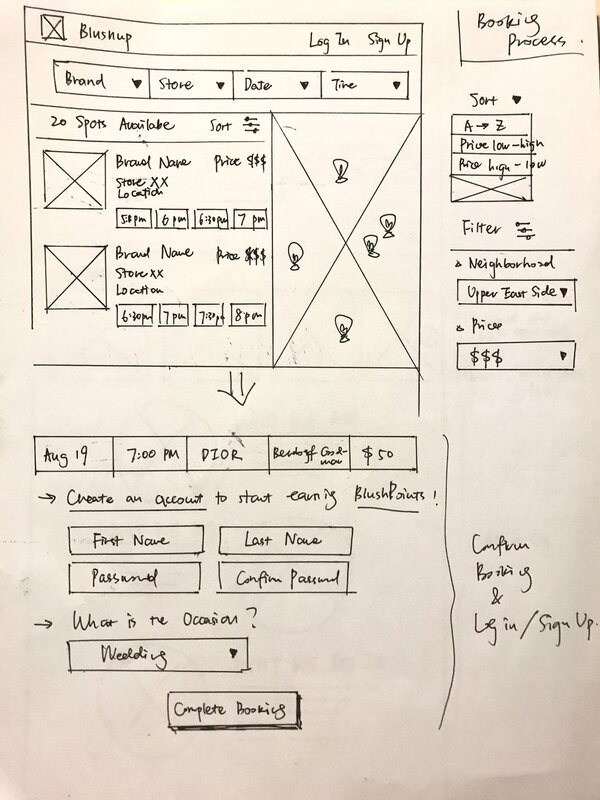 I started working as a UX Designer with Blushup CEO Monique and her team in September 2017, when she had already worked on business development and raised fund for a year. From user interviews all the way to visual design, I came up with design ideas of this unique makeup booking platform: a cheaper and smarter way for women to find the top-quality makeup service easily. We launched the website in December 2017. In the first week of launch only, we reached 1000+ signups. In April 2018, Blushup won the 2018 Retail Innovator Awards for disrupting the beauty market. Getting a delightful makeup service in New York is … difficult? Having lived in New York for over 10 years, Monique witnessed the boom of beauty industry in the past decade and women’s increasing concern about their appearance with makeup. However, after reading through so many women’s complaints about getting the wrong makeup on their big days, she was surprised to discover so much disappointment with the current makeup service experience in New York. Starting with competitive analysis, we researched on a variety of digital platforms that allow you to book a makeup service on the market, and found out that currently there are 3 main approaches for women to get their makeup done for special occasions. 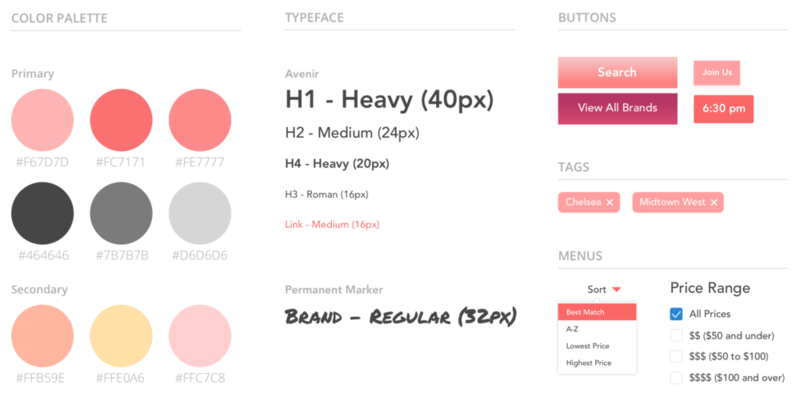 We started our competitive analysis by taking a close look at how other makeup booking services work. 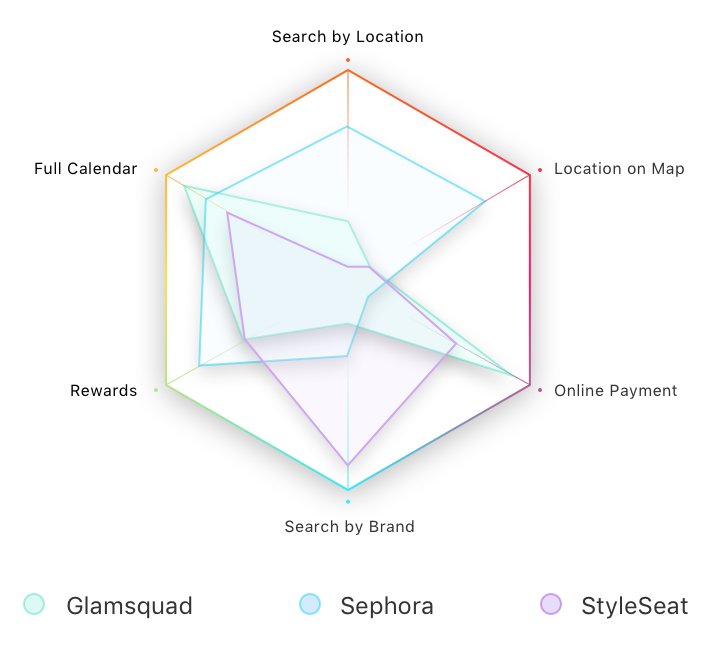 We targeted Glamsquad, Sephora and StyleSeat. What exactly are the unmet needs? With several existing makeup booking platforms for women to choose from, the lack of booking tools seems not to be the real problem here. So why there's a widespread notion that getting a delightful makeup service in New York is difficult? And what exactly are the disappointments with the current makeup service about? Starting with Monique's makeup-savvy girlfriends, we further conducted 10 in-person interviews. Our target users are millennial women (aged 18-35) with needs to book makeup service in New York City. 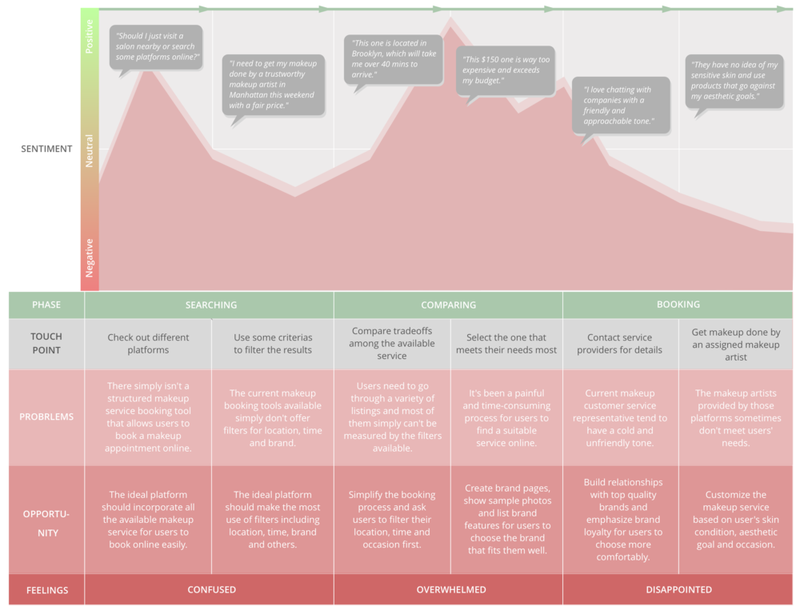 In the end, we collected over 100 notes and generated 3 insights. See the entire research process. Based on our findings from interviews and field observation, I created a journey map to understand what customers would do and how they felt in a typical makeup service process. What do the users look like? 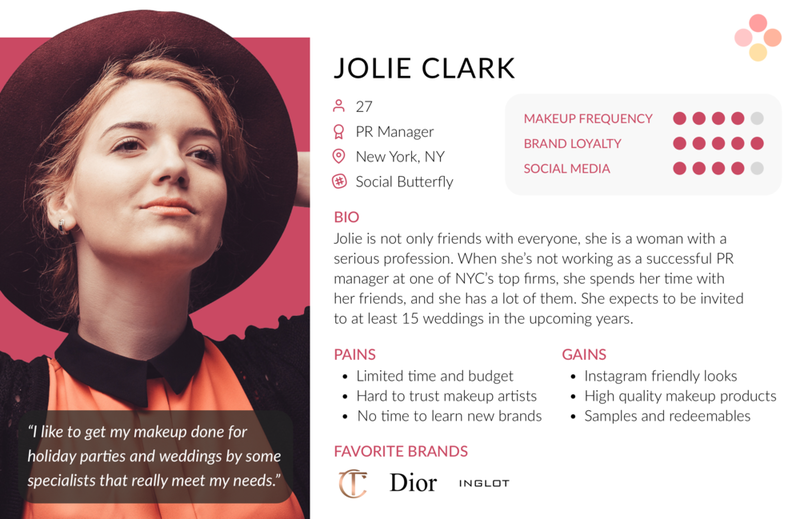 Jolie Clark, a millenial PR Manager living in New York City, represents the main persona of Blushup. With the insights from user interviews, we decided to focus on the searching, filtering and booking process to solve the three pain points mentioned above. We wanted to design a responsive makeup service booking website that aggregates the most authentic and abundant information and emphasize trustworthy relationships with top-quality makeup brands in retail stores. Learning that one size does not fit all, we wanted to design the site to not only allow for searching by location, store, date and time, but also by brand that matches women's different budgets, skin conditions and aesthetic goals. 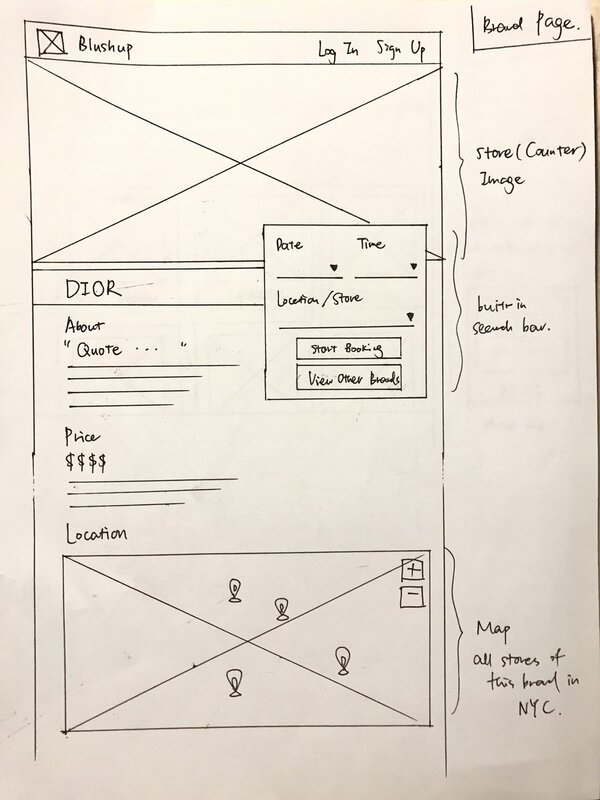 I started sketching some ideas of our website and invited users to a quick testing. 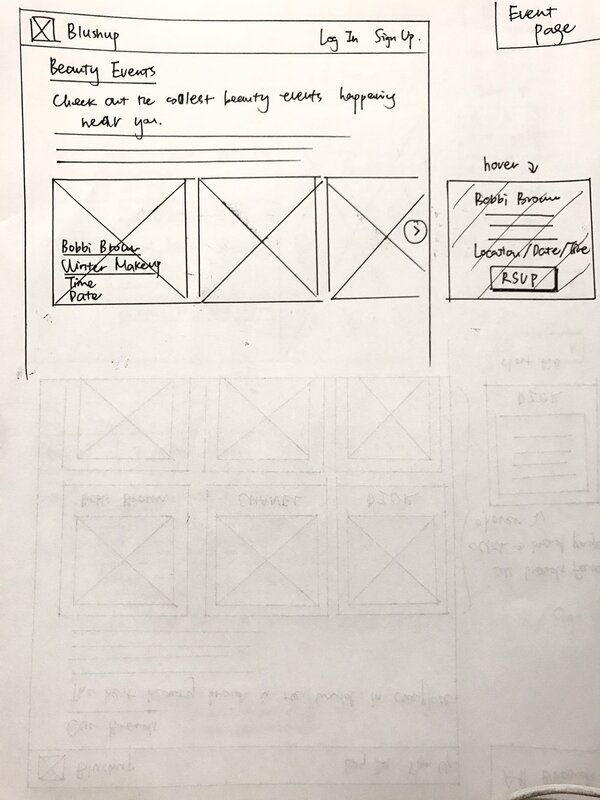 I showed them the paper wireframes and gathered their feedback. 2 observations caught my attention. 1. Users barely read the About section and didn’t really care about Who We Are, What We Do and Why We Do It even though they are important. 2. Users were looking for more filters to help them make better decisions. Results can be sorted by price, distance and ratings. We believe the right visual design can better enhance users' experience. After user testing, we made high-fi prototype to convey our essential pages. I shall discuss the design details as follow. Ethnographic methods (contextual interviews and diaries) ensured that our design was user centered. Knowing that there was not a clear understanding of the pain points of the target users, I insisted on re-conducting the user research to better design and launch the website. As a result, compared to the user feedback of the usability tests of the previous prototype, we significantly improved the product. Each member of the team should perform more than a single role. As a product designer, by collaborating closely with engineers and our CEO, I have learned to not only perform my own tasks but also understand their responsibilities more to facilitate our project.